Gunpowder Works Community Open Day – Saturday 8th September! Please find attached details of our community open day at the Gunpowder Works this Saturday from 2pm to 6pm. 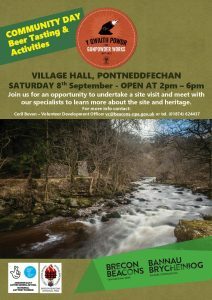 The afternoon will be based at Pontneddfechan Village Hall, one of the Gunpowder Works’ original buildings. – Free Gunpowder Ale beer tasting! In addition Sian and Jannies Tasty Treats will be serving their usual fantastic array of cakes, snacks as well as hot / soft drinks until 4pm. I really hope you’ll be able to join us and please do pass on to friends, family, members of your organisations and customers. Any help with promoting the event via social media is greatly appreciated.